Explanation: Deployed on a pop-up mast to its full height, the Sagan Memorial Station's IMP camera now stands about 5 feet above the surface of Ares Vallis - on Mars. This is one of the first images from its new vantage point, showing the rover Sojourner near a rock named Barnacle Bill. This particularly interesting rock, with a variety of surface textures, appears to be about 8 to 10 inches high. 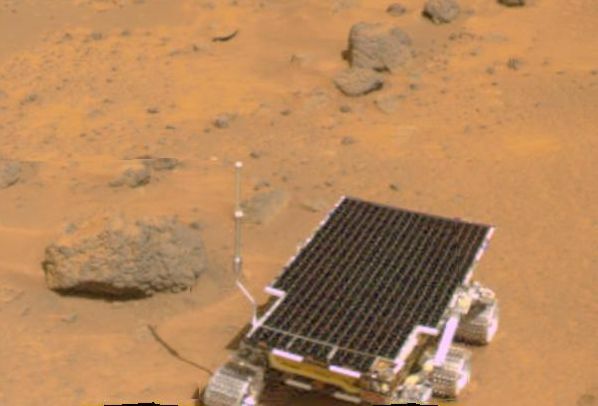 Sojourner performed an analysis of Barnacle Bill by successfuly maneuvering to place its Alpha Proton X-Ray Spectrometer (APXS) instrument against the rock. 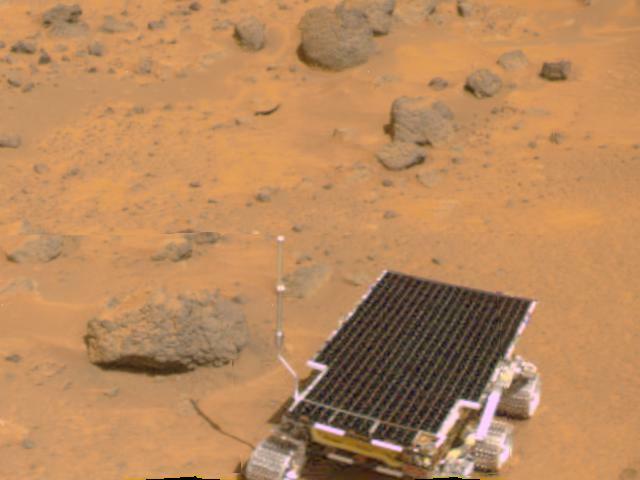 The APXS, located at the rear of the rover, is not visible in this picture. Sojourner's next destination is ... a rock named Yogi. Results describing the composition of Barnacle Bill, the martian soil and a color panorama of the landing site will be presented at a Pathfinder press briefing today scheduled for 11:00 AM Pacific Daylight Time.